Think all flowers smell good? Think again! What is nearly six-feet tall, smells like rotting flesh and, yet, is drawing in the crowds like a horticultural version of Justin Bieber? Ok, maybe that’s a bit over the top… but still! An Amorphophallus titanum is came into bloom last Saturday at The Ohio State University’s greenhouse in Columbus, Ohio and is really charming the crowds. This rare plant from the Indonesian rain forest is a sight,and smell to remember. The bloom’s fragrance is its key to attracting the right pollinators. I grow a smaller version called Amorphophallus konjac. Not into using the Latin name? My friends and family affectionately call the plants Mr. Stinky or Harry Butler after the Dayton-TV personality who gave me my first plant. You can see a time-lapse video of the voodoo lily in Columbus opening HERE. Here's my shopping cart and the damage I did. Errr, I mean the treasures I found. Knollwood Garden Center Beavercreek, OH) held their second Ladies’ Night Out tonight. The first was back in December and judging by all the cars in the parking lot it must have been a success because I had to park out in the ‘back 40’! Bruning’s Wine Cellar and Christopher’s Restaurant & Catering were on site to please the crowd and Knollwood staff was at the beck and call. It was a pleasurable way to get a jump on spring. The record setting rains in southern Ohio are causing many businesses to retool their spring sales. Grandma’s Gardens, south of Centerville, is extending their $11.99 sale on flats of impatiens and begonias through Sunday, May 1. Yippee! Check with your local garden center as their publicized sales may also have been extended. If you have checked out some of the nest cam links I have listed on the right, you may have visited the bald eagle nest cam located at the Norfolk (VA) Botanical Garden. Sadly, Viner Barb passed along word that a jet landing at Norfolk International Airport struck and killed the female eagle early this morning. To the relief of many on-line viewers, the male returned to the nest with a fish early this evening. Only time will tell what happens next. Please visit HERE to read about the amazing life of John Jame Audubon. I can’t do him justice in a short post. He overcame adversity (illegitimate son of a French sea captain) and exemplifies the spirit of young America. Mr. Audubon, you made the world a better place! The warm weather is bringing more out than the bees! 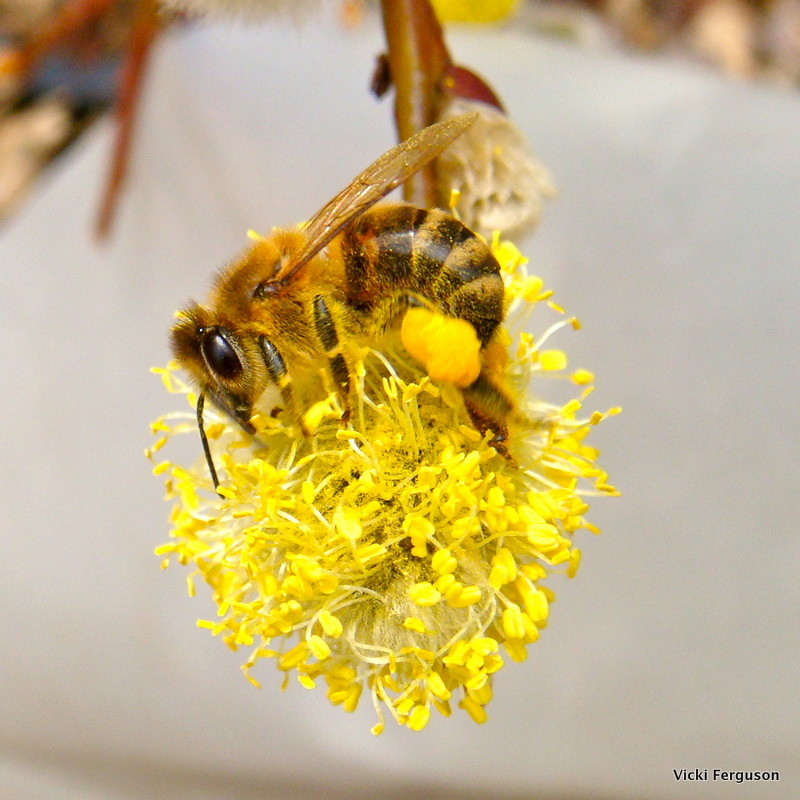 Note the pollen sacs on this hard worker in the photo…. Everyone seems to want to clean up their beds. Including me. While in the garden, I managed to embed a big sliver of a plant stem so deep in my knuckle that it required visit to the doctor. One tetanus shot, a scalpel and a suture to close the incision and I was good to go. That’s when I wish my imaginary gardener, Thor, wasn’t so imaginary! Saturday, March 26 is Opening Day at Baker’s Acres. Crazy people like me can and will drive 2 hours to visit this greenhouse in search for unusual annuals and perennials. Located east of Columbus, yet west of Granville, you will not be disappointed. 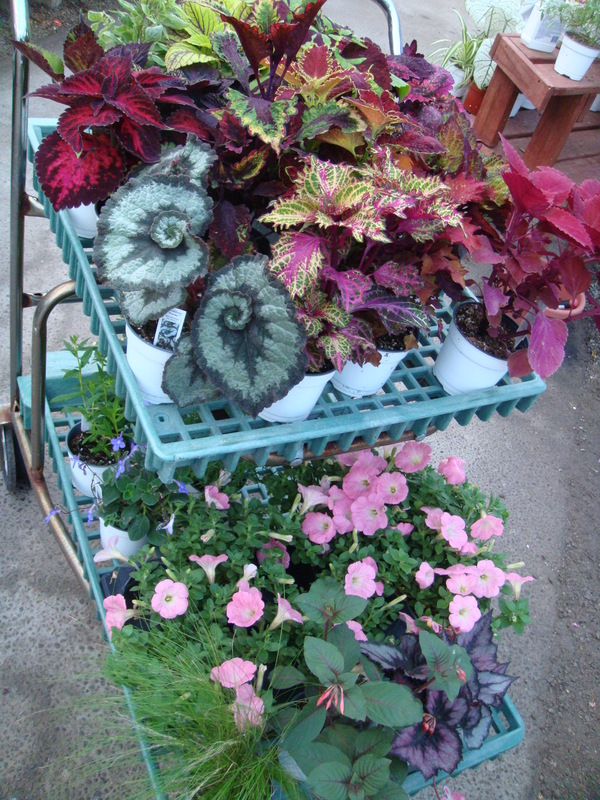 Consider this: Over 100 varieties of coleus, give or take. See what I mean? This spring, internationally renowned artist Patrick Dougherty will create and install one of his unique outdoor sculptures at Wegerzyn Gardens MetroPark. The massive structures are made entirely of woven saplings and resemble nests, lairs, and mythic shelters. 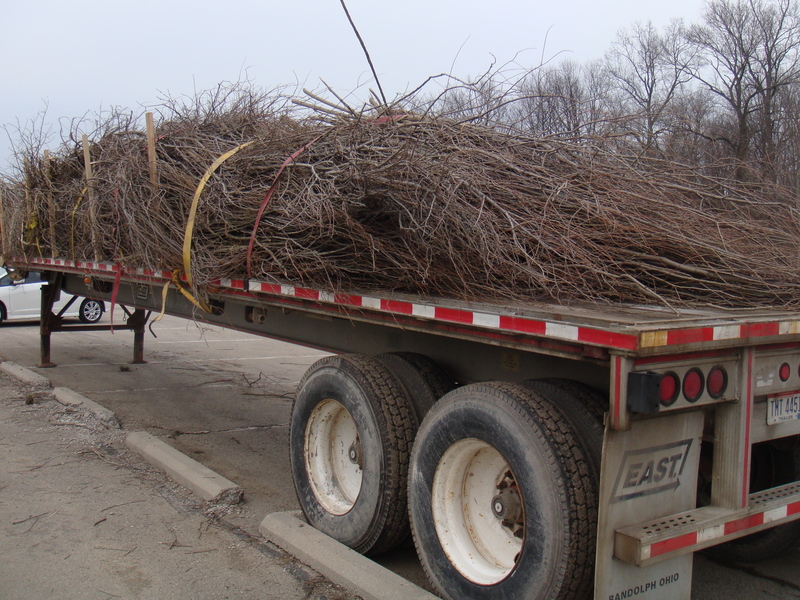 While visiting the Englewood MetroPark I came across one of the semi-trailers that is already being loaded with young willow trees to be used in the exhibit. He will be in Dayton from April 4-22 and with the help of many volunteers, create an original woven-branch sculpture that will remain in place for about two years. Sponsored, in part, by the Wegerzyn Gardens Foundation. I can’t believe how easily I got hooked on watching, or at least checking in on, the Decorah (Iowa) Bald Eagle nest cam. I feel like I’m right in the nest with them. The best part, other than the view, is that the cam streams audio as well so that you can hear what is going on. There are three eggs in the nest and the estimated first hatch date is around April 1. This isn’t the only bald eagle nest cam around. Here is a link to one at the Norfolk (VA) Botanical Garden. It does not have audio but the three chicks have already hatched and you can watch the parents feeding them. You can also participate in a moderated discussion board on the eagles. Locally, we have eagles named Jim and Cindy on a nest at Eastwood Lake. Here is that link. On Tuesday I saw another local nest in the Englewood MetroParks area. If you want to check it out, you have to park in a tiny improvised specially-marked parking spot off of River Road in Englewood and then walk about 1/2 mile to an observation point. Once there, you are still about a 1/4 mile from the nest. Even from that distance, it is a neat thing to see. Be sure to check the Calendar Events tab often as I update items there that may not be featured in the regular posts. What’s new? Aullwood Audubon Center’s Native Plant Sale and more.